Modern technology has evolved the world into a global village where people in one part of the world are connected to others not only through communication but also by direct physical contact. It is the reason that any event, disaster or festival in one part of the world has at least some impact on others, including businesses in other parts of the world. Currently, there are more than 50 Muslim majority countries while Muslims reside in most of the other countries in small or large numbers. Therefore, one can’t expect that an important occasion celebrated by 1 billion Muslims for a whole month will not impact businesses all over the globe. Ramadan comes every year for a whole month in different seasons. Each year, this holy month comes around 10 years earlier than the last solar calendar. Ramadan started this year on 17th May and Muslims are observing fast from early morning to dusk. It is usually assumed that Ramadan has negative effects on businesses as Muslims don’t eat anything for most part of the day (that affects food and beverage industry) and their performance decreases that impact productivity of businesses run by Muslims. But this is result of a narrow thinking and results of a broad vision are certainly different. The negative impact of Ramadan on food & beverage industry is just misconception. In fact, this industry gets boom during Ramadan especially in Muslim majority countries. Muslims try to replenish their dietary requirements after long hours of fast with healthy and nutritious food from dusk to early morning. This ultimately results in growth of this business even more than other times of the year. Even several global companies take advantage of this situation as their expensive but high standard products also get more sales in Muslim countries than in normal circumstances. Another important factor that enhances various businesses is different types of steps taken by Muslims related to this month. Many Muslims tend to visit Saudi Arabia and other holy places for religious reasons. Apart from that, Muslims living in non-Muslim countries also travel to their home countries in Asia and Africa to spend the fasting month and Eid holidays with families. This ultimately increase profits for airlines, travel agencies and other businesses related to air travel all over the globe. Several companies are also using this special moth for increase in their profits by providing special offers, promotions and incentives. These special offers are also provided by several international companies and they met with success. An example is the initiative by Samsung few years ago when the telecommunication giant offered to grant part of its profits to humanitarian organization for purchase of its products in Ramadan. It was meant to attract Muslims to spend on humanitarian cause in the holy month and it proved successful. The productivity for businesses in Muslim countries may reduce a bit, but many countries are trying to reduce its impact as much as possible. Few countries are trying to compensate the effects by using night time as working hours and reduce the working hours at day times and provide rest opportunities to workers at the time of fasting. Work from home is also an option for selected types of jobs that would help workers and companies both as employees can work by using their full capacity without much exertion. So, one can easily understand that the assumptions of negative effects of Ramadan on various businesses is mainly due to misconceptions and disinformation. 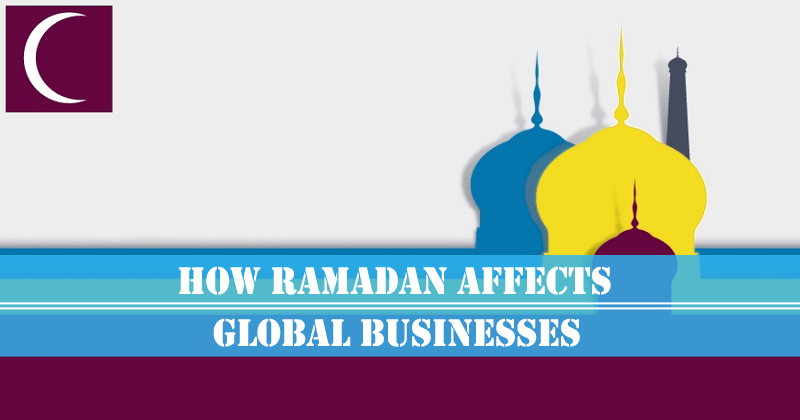 Various global businesses only have to align themselves according to the atmosphere of Ramadan and they can expect highest profits during this holy month in all parts of the world. To know about business opportunities in UAE during Ramadan and other times of year, you can contact Riz & Mona Consultancy by using our WhatsApp # 971-56-9971225.